In contrast to the fresh pink of the spoonbill, the wood stork appears oddly prehistoric. A close relative of the spoonbill and the ibis, this is the only stork native to North America. Fossils of a wood stork (or a “sister” stork—one that is very similar) were found in Brazil and date back about 10,000 years. Tropical in origin, these birds haven’t expanded their range beyond their original roots. 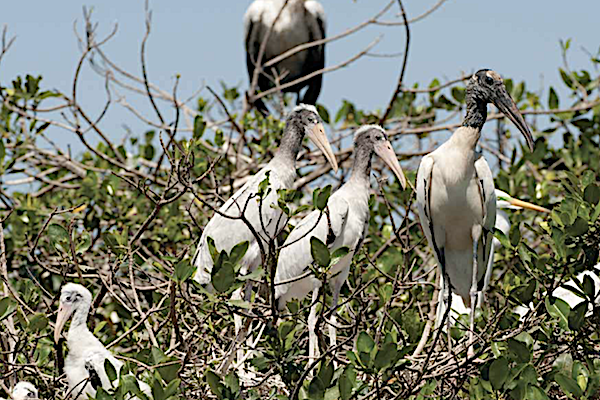 Wood storks are peculiar-looking wading birds with bald heads and necks. They are large-bodied, with dark legs and pink feet. On the hunt in the water, their long legs help them to wade easily as they maneuver their feet to stir up food from the bottom. While stalking for prey, storks keep the tips of their open bills in the water. When they feel something, they snap their bills shut, capturing the meal. Fish are the main diet but not their only food item. They also enjoy frogs, toads, snakes, and large aquatic insects. 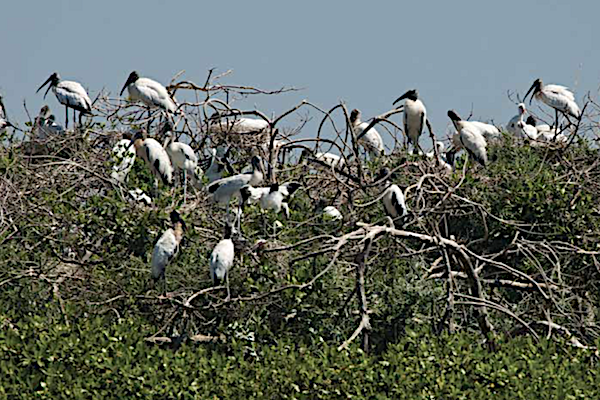 Wood storks nest in small colonies, usually in cypress trees or in mangrove islands over water. Carrying sticks and twigs to the nesting site in their 10-inch-long bills, they construct their nests. They reuse these nests for many seasons, constantly improving them. 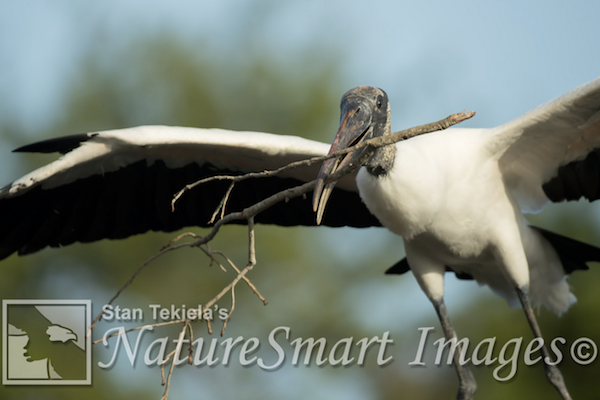 Wood storks nest only once per year, laying 3–5 eggs in a clutch. Both parents take turns incubating for nearly a month before the chicks hatch. Parents bring small fish to the babies in the nest for nearly two months. Because the babies are in the nest for so long, the parents need a constant food source. It makes sense that they nest in the dry season, when smaller ponds dry up and expose more fish. If sources of fish are meager during the year, the parents will skip the next breeding season. Juvenile storks are white with yellow bills. As they age, their heads and necks become bare, exposing dark skin, and their bills turn dirty gray. They don’t become sexually mature until at least 4 years of age. 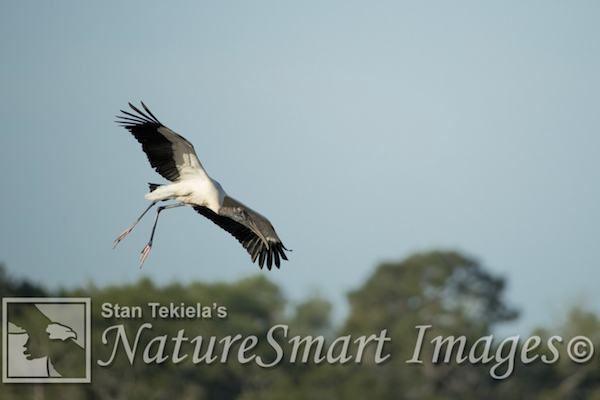 When storks move from one feeding area to a better one, it’s not uncommon for them to fly at high elevations. They have broad wings that span 5 feet across, making it easy to soar on natural updrafts, called thermals. They ride the thermals before landing at the next shallow-water feeding area where more fish are concentrated. Stork populations have never been very high in North America, but small populations occur in southern states, such as Florida, Georgia, and South Carolina. An endangered species for many decades, storks were upgraded to a threatened species in June 2014 due to recovery efforts and laws that protect the birds. 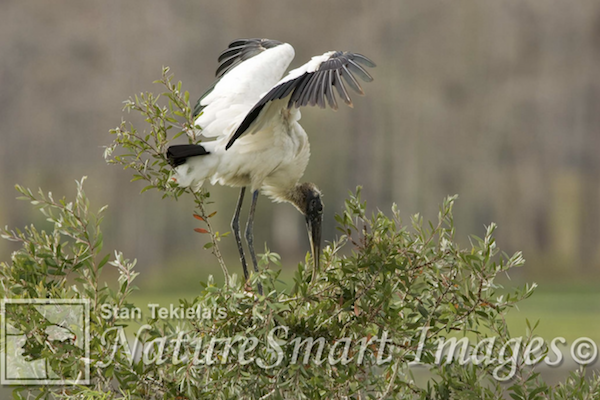 Today, the wood stork is on its way to becoming an avian success story. If you enjoyed this post, consider Wild Birds: North America’s Most Unique Birds by Stan Tekiela. For more stories about wildlife and nature, sign up for our newsletter now!